These are a few of the Buddha’s discourses which have been translated and annotated by Bhante Suddhāso. The addition of interleaved explanations provides an easy way to understand the content and applicability of the discourses as one reads them. One of the most important discourses in the Pāli Canon. This sutta provides an overview of many different circumstances in which the underlying taints of the mind become apparent, and describes the appropriate ways of cleansing the mind in each case. In this discourse the Buddha describes a total of ten kinds of harmful attitudes that prevent us from making progress on the path: five are labeled as varieties of “mental desolation” (cetokhila) and five as varieties of “mental imprisonment” (cetaso vinibandha). Of particular interest to meditation practitioners, this discourse describes five techniques for dealing with unwanted, unwholesome thoughts when they intrude upon our mind. On this occasion, the Buddha was approached by a man grieving for his dead son. The Buddha took the opportunity to explain how attachment to the people and things that we love leads to misery and anguish. This important discourse explores the subject of faith and belief. The Buddha identifies ten unreliable bases for belief, then demonstrates how we can use our own experiences to arrive at assurance in regards to spiritual practice. 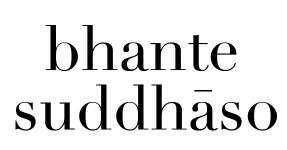 The Dhammapada, a collection of short, poetic expressions of the Buddha, is one of the most well-known sections of the Buddhist scriptures. The first chapter is composed primarily of pairs: two sets of verses that demonstrate two sides of the same situation. The second chapter of the Dhammapada is focused on the theme of vigilance (appamāda) – the constant effort to keep watch over the mind, and to protect it from harmful impulses. The theme of the third chapter of the Dhammapada is the mind itself, and contains some of the most memorable similes from the Dhammapada.